Brahman are easily identified by the hump on their back and long floppy ears. The most common colors are solid gray or solid red. 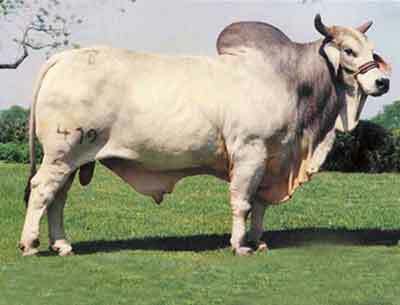 The Brahman breed originated from Bos indicus cattle originally brought from India. Through centuries of exposure to inadequate food supplies, insect pests, parasites, diseases and the weather extremes of tropical India, the native cattle developed some remarkable adaptations for survival. Brahman have loose saggy skin with sweat glands and the ability to sweat freely through the pores of the skin, which contributes materially to their heat tolerance. They can walk long distances to water and these cattle thrive where other types of cattle, at best, merely survive. These are the "sacred cattle of India," and many of the Hindu faith will not eat meat from them, will not permit them to be slaughtered, and will not sell them. India has more cows than any other country. They are nearly all Brahman, the most popular breed in the world.